On Friday, we all met to began our journey in Angelic Reiki. 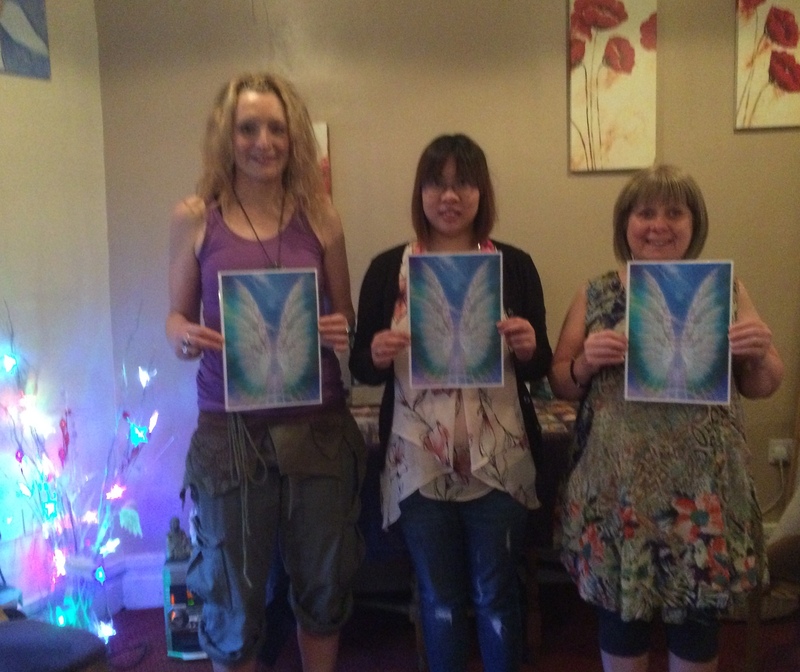 Three lovely Ladies wanted to connect with the Angels through Angelic Reiki. All very different, with their own unique qualities. One lady had, had the calling for years but due to circumstance was unable follow it, to until now. On Friday night we got to know each other – the group gelled instantly and they received their first attunement. Leaving happy and smiley that evening. On Saturday, I opened the workshop, followed by a cleansing, meditation and attunement. We had a delicious Lunch, (which is included within the price of the course, as well as refreshments). Saturday afternoon was spent healing, each lady taking it in turns to heal each other. Discussing how they felt, and we encouraged the recipient to discuss how the healing had helped them. In Angelic the person giving the Reiki is the Channel for the Angelic Realm, both the Healer and the person receiving the reiki are receiving healing. It is a very relaxing, beautiful experience. We had a very full day on Sunday, we had a Cup of Tea and a Chat, to discuss our experiences followed by Cleansing the Workshop space, and a Meditation. We practised 3 different Healing methods within Angelic Reiki. The final attunement is at the end of the day, all the Angels come forward to give their Blessing. Its a beautiful attunement, all the angels cheering as you have been attuned by the Angelic Realm. Wonderful friendships were made, and a beautiful journey began. My next Course is 24 – 26 August 2018, if you would like further information call/text me on 07966 302468 or e-mail angelicwingstherapies@gmail.com. Feedback from the course AG, Gomersal Wrote: Thank you so much for a fantastic reiki 1 & 2 course. I can highly recommend it, for Anne is an amazing teacher and the atmosphere is Angelic. If you are looking in to attending one of Anne’s workshops, I would book without hesitation. 2 Responses to 22 – 24 June 2018 Angelic Reiki Practitioners Course 1 & 2. I had a wonderful experience on this Angelic Reiki Healing course. It was amazing as I had been searching for a course like this for a while. I’ve wanted to heal other people for as long as I can remember and going on this course had enabled me to heal deep stuff within myself that had been going on for years, as a result of the healing I feel different, happy! Anne is a good teacher and she answered my questions about Angels/ healing/past lives… Healing with the galactic angels and learning about ascended masters was facinating. I’m hoping to help other people with what I’ve learnt. I highly recommend this course.